In this brilliant and truthful essay collection, Kim McLarin covers just about every aspect of living in America as a Black woman. I was enlightened, amused, made quite uncomfortable at times, and impressed over and over by her intelligence. You know I have a thing for intelligent women. Everything she covers is important to a grown or growing woman: on-line dating, depression, racial injustice in the courts, anger, marriage, motherhood, bad partners, revenge vs non-violence, and more. The whole perspective is a Black woman's. I know, it says that in the subtitle, but it bears repeating. The essay that punched me the hardest, "Becky and Me," considers friendship between Black and White women. As I read I felt there was not any way for me to be a good friend to a Black woman. I had to look at why I have not had a Black female friend since the third grade. I spent hours trying to figure out how I could make a Black female friend at this point in my life and to reason out why I do not even cross paths with Black women in my daily/social activities. I wondered if Kim McLarin would accept me as a friend and truthfully I felt unworthy, unsure of myself, even kind of rejected. As I gradually got over myself, I realized (not for the first time) that Black Americans have spent way more time observing and figuring out White Americans than we have spent attempting to get a true picture of them. It was James Baldwin who got me started thinking about all that but he is a man. My education is not complete, nor is my experience. The inherent and continuously glossed over racism in this country will give us problems for a long time to come, perhaps always and forever. This book is a valuable resource I think for both Black and White women and men. Kim McLarin is bold, intelligent, relentless and brave as a writer and as a human being, but what stood out most for me in her collection was her honesty. A Grown Black Woman Speaks. Yes, she does. I had not heard of this book, or, indeed, of this writer, but it certainly sounds like a work from which many of us could learn quite a lot, including perhaps gaining a fuller understanding of the ways that racism is practiced in our country. I recommend it for learning those things. You do quite an homage to this essay collection. I agree that Black people have probably spent more time watching and understanding white culture than the opposite; they have history to blame or thank for that. I think she would be honored to have you as a friend, as you too are a very intelligent woman. Wonderful review! 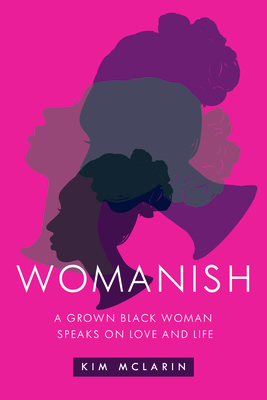 Womanish sounds like a wonderful read. I've heard nothing about this book but after reading your review, it sure sounds like a powerful story. It is from an indie publisher, though the author has 3 previous novels. I wanted all my followers to know about it because it is powerful. I had to google the author, since I didn't know of her, seems she's in the Boston area and a former journalist. Thought-provoking essays it sounds like. Thx for the intro to her. That's good you googled her. She hasn't published a book in a while until this one. I read one of her novels, Jump at the Sun. It was good. I will have to read this one, thank you for bringing it to my attention!! You are welcome. I really like her take on things.